Among dance makers, Joshua Manculich is especially conscious of the myriad micro-collaborations that dance is constructed from. Among all the many different forms of art, Dance is probably the one that is most made from the art of community. There are other kinds of expression that are built from collaboration — rock bands and symphony orchestras, theatre and opera companies, and sometimes even some of the visual arts combine in real time the artistic expression of different individuals. But in dance, the intricacy and precision of multi-dimensional movement requires an interaction between each artist that has to rely on connections far beyond that moment on stage. Johnny Nevin: In Scenic Route, one of the ideas that you’re exploring is the relationship between an artist and an audience. In concert dance, there are many ways in which this relationship varies — there are huge concerts where the the artists are on a somewhat distant stage, and everyone in the audience is in rows of seats, and there are other performances where the audience is closer, the seating may be in the round or even on stage, and in some cases, the audience is even included in the performance. But these may be only superficial variations in the more essential idea that you’re considering: the question of what is important in this relationship between artist and audience. Can you tell us a little about how this idea developed, and about what you’re considering in the design for Scenic Route as you consider this idea? Joshua Manculich: I am fascinated by the audience/dancer relationship – the capacity of that interaction – the influence of a work. Originally I wanted this work to have an embedded “act of kindness” within the work. I didn’t know what that meant but there is a Joni Mitchell song where she sings about “human kindness.” This thought really stemmed out of the question: does a dance concert, a work HELP someone? Funny enough – this work has progressed in a way that reminded me why I love dance. Through this process, I was reminded that we each experience a different degree of awareness, in other words, we all have the ability to coast through a day, an event, or perhaps find ourselves so engaged with the present moment. Dance requires a degree of being present that an audience member can (hopefully) experience through: 1) relationship of dancer to dancer 2) dancer to music 3) dancer to space 4) and the BIG one the relationship of the dancer to themselves! In this process, over the course of four days, it became clear that each of us have had a scenic route in our life – a detour from what we had aspired to – that influenced our life for the better. Johnny: There’s another important relationship in concert dance — the relationship between choreographer and dancers. Although we see all kinds of discussion about some aspects of this, it’s unusual to hear someone speak of it as you do in terms of the overall nature of the relationship. You’ve mentioned the idea of ‘sensitivity’ as one of the hallmarks of this relationship, but of course it has many dimensions. Having been on every possible side of this experience as dancer, choreographer and teacher, can you tell us why you consider it important to explore this? Joshua: I am drawn to people who provide a work space that combines rigor, creativity, and transparency. To piggyback off of question 1, if we are going to engage with a viewer through the lens of the body, this requires the choreographer and dancer to tap into sensation and lived experiences. THIS REQUIRES reflection, creativity, and a vulnerability. In other words, I can’t imagine asking the dancers to do this work without asking each one of them, what they are hoping to say in this creative process? They will be people who carry this work forward and it is important for me, for them, that they can find a mental and spiritual space to draw from. In the way a song was written for a reason, I love asking the dancers the reason we are here together – what we each hope to say. In this process, over the course of four days, it became clear that each of us have had a scenic route in our life – a detour from what we had aspired to – that influenced our life for the better. 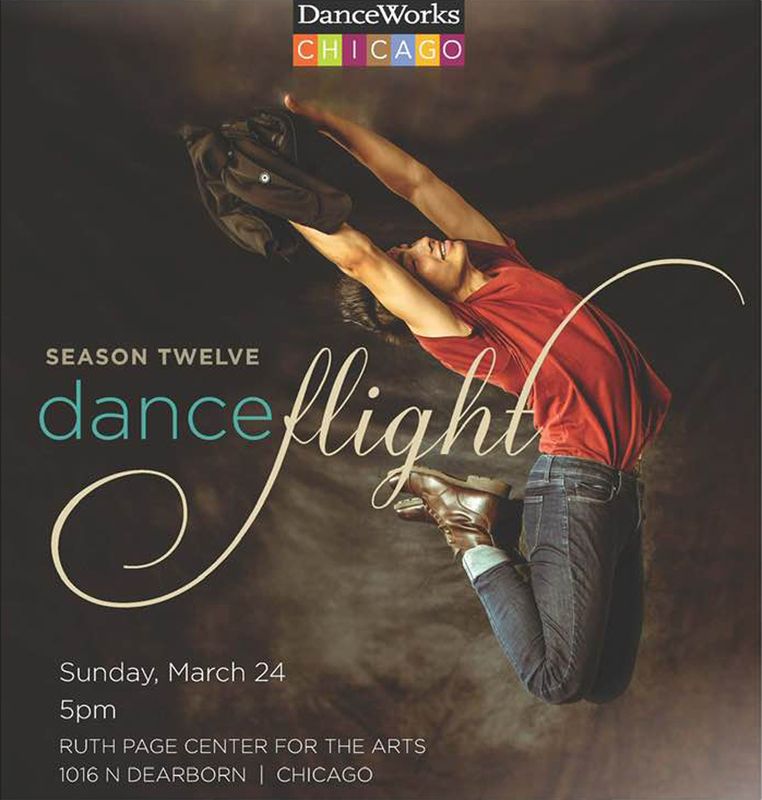 DanceWorks Chicago presents DanceFlight on Sunday, March 24 at 5pm at Ruth Page Center for the Arts, 1016 N. Dearborn St., Chicago. The program will include NEW works by Hanna Brictson and Joshua Manculich plus repertoire favorites. Tickets are $20 in advance (closed at 2:00pm), $25 at the door. Seating (general admission) is limited. Valet parking ($15) available one hour before the performance start time. Tickets are available online from DanceWorks Chicago. DanceFlight is like a wine flight, a sampling of sorts. Join us as DanceWorks Chicago offers an assortment of dances to fill your one-hour dance card! Stay afterwards for an informal, post-performance meet the artist session hosted by the dancers.